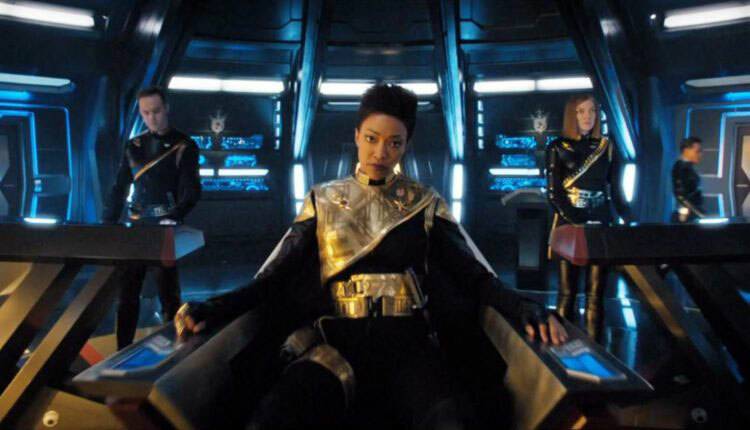 It’s hard to believe that after years of anticipation, speculation, and excitement, Star Trek: Discovery‘s fist season has come and gone. Now that I’ve watched Discovery‘s fifteen episodes many times over, I’m happy to report that overall, I love this contemporary incarnation of Star Trek and I can’t wait to see where we are taken next (particularly after that closing scene). As we prepare for the next set of adventures, I’ve spent a lot of time reflecting on the show. 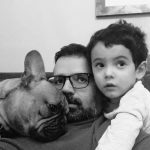 Below I’ve compiled a list of the ten things that have stuck with me the most; seven of which I love and three that just missed their mark. 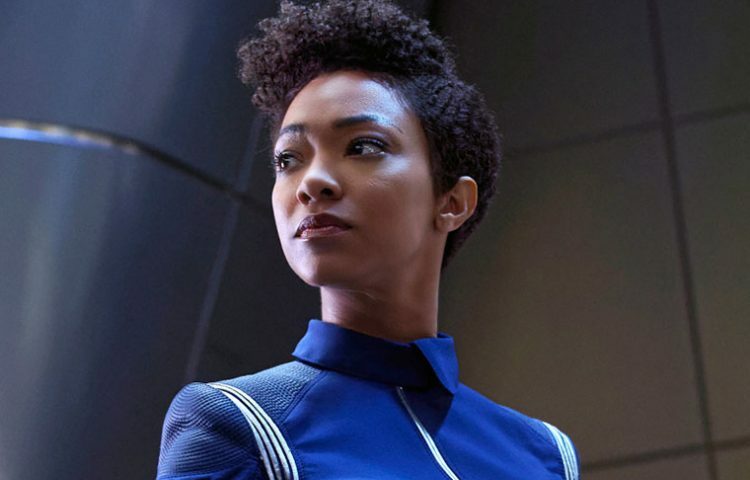 As the show’s lead, Sonequa Martin-Green brings a genuine excitement and a fresh perspective to Trek; she leads the show with beauty, grace and gravitas – and she shares it with all of us regularly, online. Her excitement for being a member of the Trek family is tangible and contagious. Martin-Green infuses Michael with both a distant complexity and a familiar warmth. We’re lucky to have her leading Trek’s charge into the future and I for one can’t wait to see what’s next for now Commander Michael Burnham. Martin-Green’s portrayal of Burnham is arguably at its best in “Lethe.” Written by Joe Menosky and Ted Sullivan and Directed by Douglas Aarniokoski, “Lethe” is Disco’s finest hour to date. The episode delivers a high-octane story punctuated by a deep understanding of Trek lore: an understanding that expertly complicates the now fifty-year Sarek/Spock dynamic in a way that no one saw coming. The episode beautifully delivers a stand-alone story and a continuation of both Michael’s character arc and that of the Klingon war. The effects (those opening shots on Vulcan! 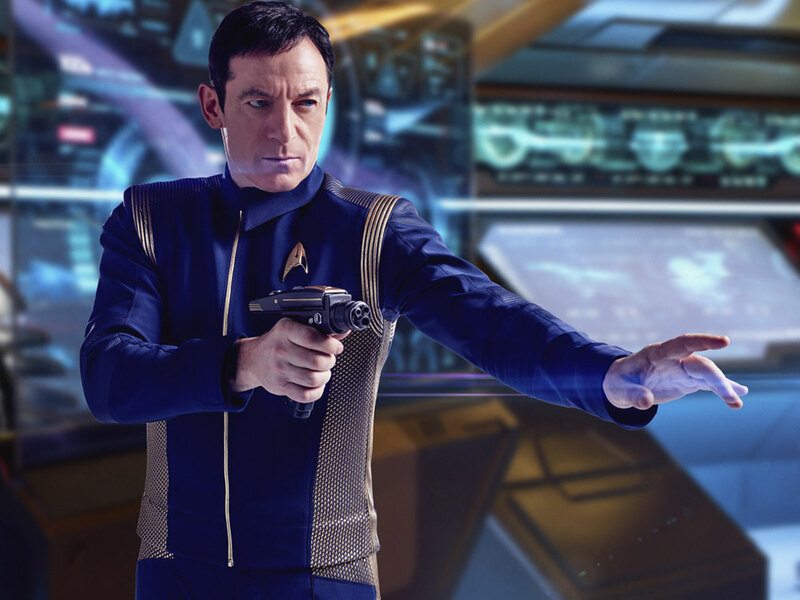 ), James Frain’s Sarek, and the integration of Tyler into Disco’s crew are just several of the cherries on top of this fantastic story – this is 21st century Trek at its very best. The design of our show’s flagship starship wasn’t love at first sight for me. The U.S.S. Discovery has, however, grown on me. It is from several angles (particularly the top) a unique and streamlined vessel. However for my money, the Walker class U.S.S. 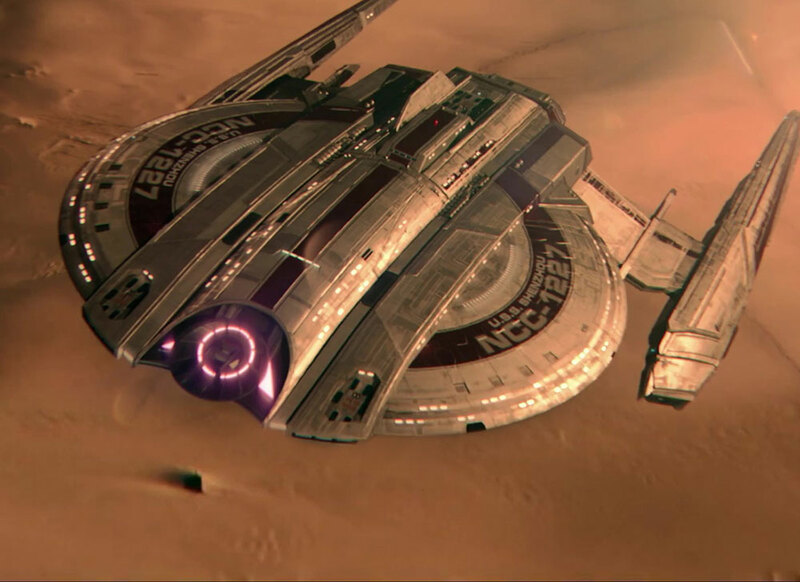 Shenzhou is Discovery‘s greatest single ship – from that very first teaser, I was smitten. Designed by the legendary John Eaves (who’s given us countless iconic Trek ships, including the Enterprise-E), the Shenzhou perfectly marries that classic Starfleet aesthetic with a contemporary sci-fi sensibility – this is a ship with a long history, one that, from a design point of view, is perfectly slotted into a gap of Trek’s history that until now has not been much explored. Eaves’ mastery of his craft is on full display with the Shenzhou and this new ship is for me, one of my top five starships of all time. With the exception of Jadzia Dax’s bachelorette party, Trek has never done partying particularly well. Sure, it shows us characters enjoying themselves in a variety of ways (theater, poker, chess, darts, etc.) but rarely do we witness Starfleet officers throwing caution into the wind. Discovery‘s seventh episode, “Magic to Make the Sanest Man Go Mad,” which is itself one of the best episodes of this first season, really lets loose – and it is fun to watch. The party scene – which is repeated over and over, thanks to Rainn Wilson‘s Harry Mudd – shows officers, soldiers, and scientists, of all shapes and sizes, at their most relatable and human; it’s also an ingenious focal point for the episode to revolve around. We’ve had many a Starfleet officer over the years whose motives weren’t exactly genuine. From his first appearance to his last, Lorca broke the Starfleet officer mold and I loved every second of it. Lorca was dubious, secretive, violent, and ultimately an impostor – not exactly Captain Picard. Lorca manipulated the show’s audience as well as he manipulated the Discovery‘s crew. He was played beautifully by Jason Isaacs who, at every single turn and with quite literally every single character on the show, lulled all of us into a false sense of security. Lorca kept us on our toes and will undoubtedly be a topic of discussion among Trekkies for years to come. Lorca’s universe of origin loomed large over Discovery. Disco’s take on the mirror universe was responsible for some of the season’s most memorable character moments; think of Tilly pretending to be Captain, Saru actually becoming one. The mirror universe was fun, energizing, and gave us amazing Michael Jackson inspired uniforms and hardware. We’d spent almost the entirety of a dozen episodes focused on the Klingon war and all of a sudden we’re taken on this brilliant sharp detour that I was immediately (because of the quality of the mirror universe episodes of old) invested in. Everything just worked (and it could have easily not). From a storytelling perspective, it was definitely a gamble, but one that paid off. The mirror universe was also responsible for one of Disco’s most memorable moments and arguably the creepiest scene in all of Trek: mirror tooth-brushing Stamets. Tilly is easily Disco’s standout and most unique character. Had I put a bet on who would have won that title when the series started, Tilly wouldn’t have cracked my top five. I can’t think of an analogous Trek character for her – and its refreshing. She’s socially awkward, yet delightful. She’s insecure of her abilities, but stands up to the challenge. Ambitious, loyal, caring, and most of all overtly human, I found myself fully invested in Tilly and can’t wait to continue rooting for her. Mary Wiseman brings a youthful energy, an energy that finds the wonders of the universe wonderful; and you truly feel it when she says that she loves feeling feelings. Hands down the season’s MVP. Not every episode of Discovery worked. While as a whole the series exceeded my expectations, “Si Vis Pacem, Para Bellum” is easily the season’s weakest link. The episode just doesn’t work on any front. This is most noticeable because of how much I like the character of Saru (and Doug Jones by extension). This episode is meant to represent a turning point for his character, but due to the disjointed storylines, Saru’s emotional payoff, which should have been there in spades, just wasn’t; a missed opportunity. The episode’s shortcomings are particularly noticeable as the episode follows, “Lethe” and “Magic to Make the Sanest Man Go Mad,” two of the series very best shows. With the exception of the last 10 minutes, “Will You Take My Hand?” feels unnecessarily rushed. The episode certainly has some memorable moments (thanks Tilly!) yet it is far from the sum of its parts. This is most noticeable in the way the episode wraps up the Klingon war arc. No doubt we shall see ramifications of L’Rell’s rise to power in season two, however, I was surprised at how quickly, and with how little information, this season long war – with all of its ramifications for the quadrant – was wrapped up. The war should have had one more episode devoted to its resolution. I understand that maybe the producers didn’t have the budget for another episode. But with the freedom that subscription services like Netflix or CBS All Access provide a series, it’s a curious creative choice not have had at least several more scenes devoted to explaining the war’s resolution. I’m gonna cheat a little with this last one. I so loved the show and, most importantly its characters, that I wished we would have spent more time with them outside of the Klingon war or the Mirror Universe. So many of the show’s most memorable moments were when we were just with our crew in smaller, character-driven scenes: think of Burnham and Tilly’s run and after-run meal, Burnham and Tyler’s dynamic during and post-party, Stamets and Culber brushing their teeth, Lorca’s speech to Burnham in “Context is for Kings,” etc. This crew of characters, and troop of actors, is so good, I want more opportunity to spend time with them outside of larger galaxy changing affairs. Here’s hoping the second season gives us more of these – and extends them to include the fantastic supporting crew. 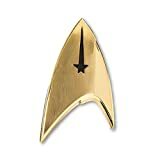 While the above is not a definitive list – I could do an entire blog on my love for all the new Starfleet gear (those phasers, delta shields, etc.) – it is meant to stir conversation and debate. So do let me and the TrekNews.net crew know what you think in the comments below and on social.